Louisville's Waterfront Park, barely twenty-five years old, is recognized as one of the world's premier urban riverside attractions. Praised for its innovative landscape design, the Park has been embraced by the public, currently attracting over 1.5 million people annually to enjoy a touch of nature on the banks of the Ohio River. What makes Waterfront Park so special is that a quarter century earlier, this same land was covered by an industrial brownfield wasteland of scrapyards, sand and gravel operations, warehouses, asphalt plants and railroad tracks. Louisville's Waterfront Park: A Riverfront Renaissance tells the story of a determined community that dreamed of a world-class park at the river's edge, and how their vision was achieved. 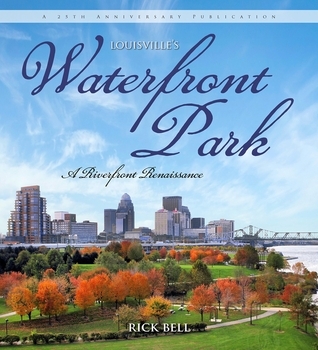 One of the stated goals of the Waterfront Development Corporation, the agency established to conceive and build Waterfront Park, is "to respect the history and character of Louisville; to create a place where nature and the city meet in a way that is unique to this time and place." Located at a transportation crossroads rich in history, Louisville's waterfront progressed from its origin as a frontier military outpost during the American Revolution, through decades as one of the nation's premier inland river ports, to become the home of heavy industrial installations. Now this same area has been transformed into an entirely new vision of a modern city park. Rick Bell is a native of the Portland neighborhood of Louisville, Kentucky. He serves as the Executive Director of the U.S. Marine Hospital Foundation in Louisville, and currently resides in its Crescent Hill neighborhood. His previous book, The Great Flood of 1937, is a thrilling record of the worst natural disaster in Louisville's history.